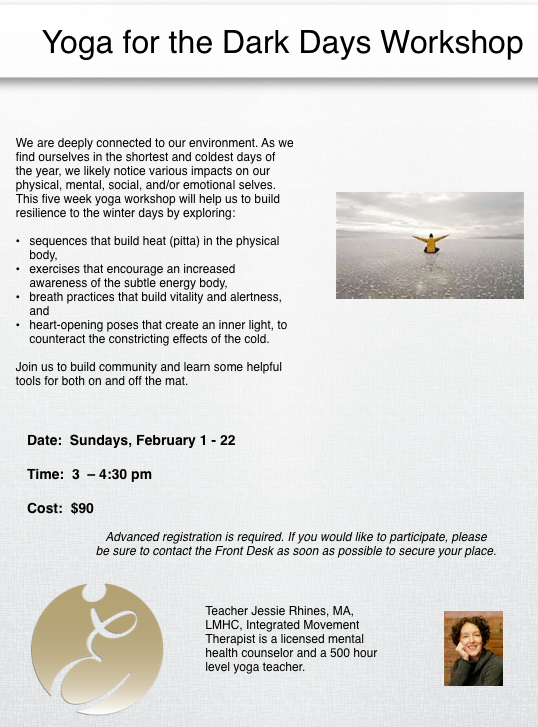 If you are new to yoga, this class will answer your questions, introduce basic poses, help get you started and get you moving. If you are stiff, have injuries or would like extra help getting going, this workshop is for you. If you are already enjoying yoga classes you still may benefit, by learning refinements to your postures, and learning to understand the mechanics of your body. For this month’s workshop we will focus especially on the hamstrings and hip flexors as they relate to correct alignment and health of the lower back in asana practice and in daily life. Please arrive at least 15 minutes early to allow time to check in and get settled and so that we may begin on time. TEACHER: Kathy Pincoffs was trained initially in the Iyengar tradition, and is a graduate of the two year teacher training program of the Iyengar Yoga Institute of San Francisco. Since that time she has continued her studies, not only with many Iyengar teachers, but with BKS and Geeta Iyengar in Pune, India. She has branched out in the last 15 years learning from teachers from many schools as well as from some of yoga’s best innovators. Theanatomy, physiology and kinesiology in the curriculum at IYISF, Kathy’s training as a massage therapist and personal trainer, and Kathy’s 30 plus years of teaching and practice provide the basis for this workshop. Unlimited Yoga Classes for $15 at Charm City Yoga (Severna Park and other locations).